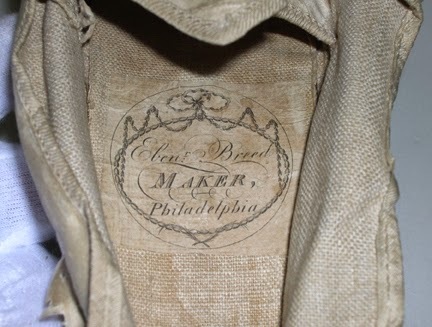 On a search for American shoemakers labels from the eighteenth to early nineteenth century, the label “Ebenezer Breed, Philadelphia” turned up three times as I scoured collections from Virginia to New England. 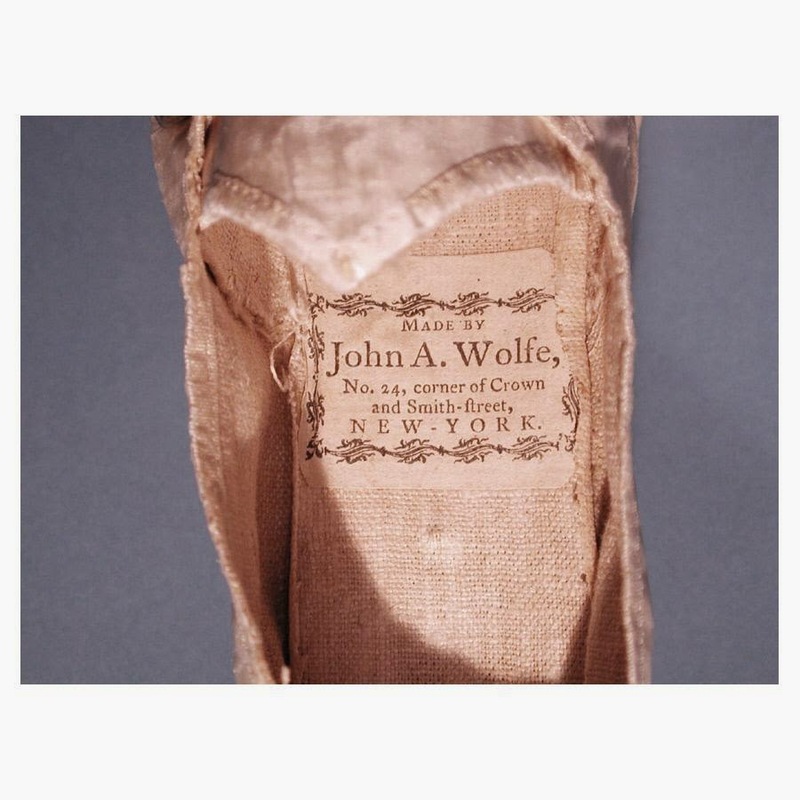 It is remarkable to find more than one example of any given early American shoemaker’s labeled craft, yet Breed’s shoes are found in the Delaware Historical Society, the Maryland Historical Society, and the private collection of the Lady’s Repository Museum. The existence of three pairs hinted of a wide circulation, which required a deeper look into who Breed was and how his shoes had been saved. Wedding shoes of Dorcas Armitage Lewis, made by Ebenezer Breed. 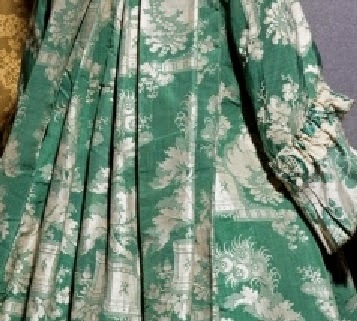 Worn c.1790. Ebenezer Breed (1766-1839), shoemaker and merchant capitalist, has been credited with the expansion of the American shoe market as a major promoter of American manufactures. He was born in Lynn as the son of a wealthy, Quaker family which had strong ties to shoe business as decedents of the first settlers in the town. At the age of 20, Breed moved to Philadelphia to begin a shoe business which capitalized on work of Lynn shoemakers. He operated out of a retail establishment on Third Street below Market, near the bustling city market at the intersection of Second and Market. He purchased the storefront in 1790 and sold it just two years later to travel abroad. painted by Benjamin West, 1792. 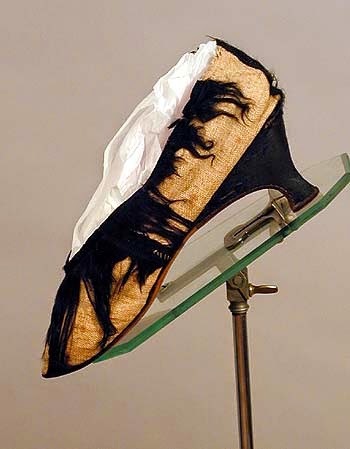 Lynn shoes from the mid to late eighteenth century were not considered particularly prestigious. In fact, they had a reputation of being rather cheaply made. It was Breed who challenged the traditional preference for British styles and products, and he promoted not only the small shoemaking town of Lynn, but the newly formed nation through his craft and business. In an effort to improve shoe manufacture in Lynn, Breed spent a fair amount of time in Europe in order to understand trade secrets (including the use of Moroccan leather) and secure business connections through which he could ship fine quality materials back to Lynn. Breed’s Lynn-made shoes were being shipped as far as Savannah, Georgia. Soon after the American Revolution had ended, French and English shoes were being sold at a cheap rate which was discouraging for American shoemakers. With the support of other Philadelphia merchants, Breed played the role of lobbyist and proposed to Congress for a protective tariff to be placed on imported shoes and boots. Congress was at the time holding their sessions in Philadelphia. At various dinner parties hosted by his Quaker allies who offered up their large homes, Breed was able to demonstrate his passion for the protective tariff. The most successful dinner party was held in honor of James Madison. “Charming ladies”, including Miss Dolly Payne, insured the attendance of certain Congressmen and other government officials. That evening, shoes were discussed between every course and by the end Breed had persuaded Madison to place a high duty on shoes and boots. The demand for American-made shoes rose significantly in the 1790s, with the help of protective tariffs and the events of European wars. The increased demand for American-made shoes is illustrated by the proliferation of labels and branding found in women’s shoes that began during this period and expanded throughout the nineteenth century. With help from Breed, these developments made America a global leader in shoe manufacture. Meaghan recently earned her M.A. 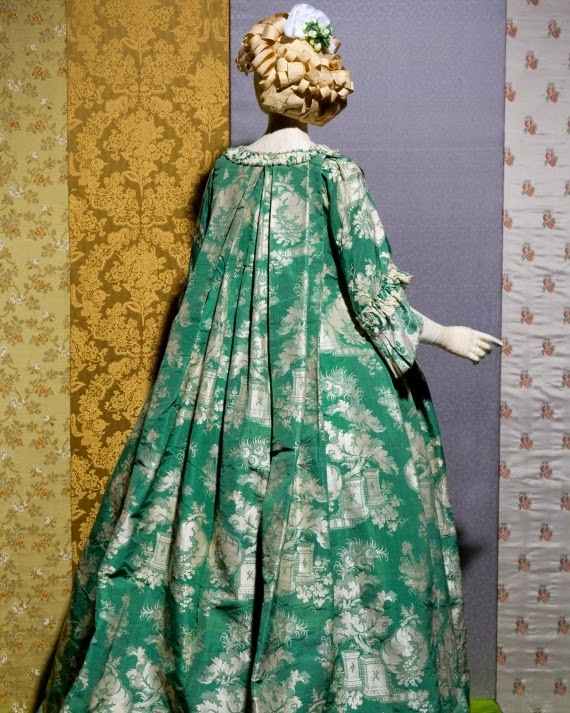 in History of Decorative Arts from George Mason University. Her thesis focused on early American shoemakers, their labels, and their links to American economic independence. Her advisor was Professor Mary Doering and I was honored to be a reader for her thesis. This post offers a window into her important research. 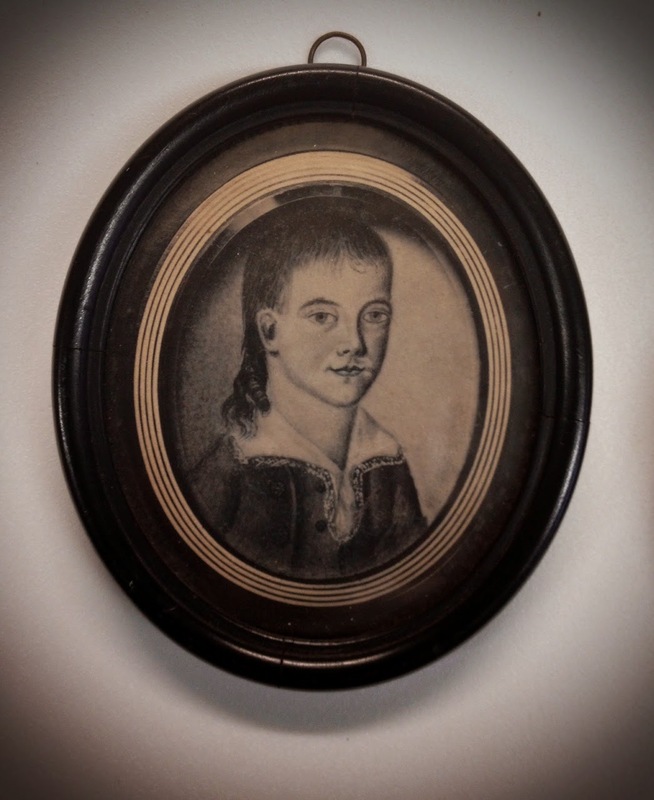 The larger family story surrounding John Hancock is one worthy of examination as we untangle the biography of this complex and somewhat elusive American Revolution patriot. Two thorough biographies of the man add considerably to our understanding: William Fowler’s The Baron of Beacon Hill: A Biography of John Hancock and Harlow G. Unger’s John Hancock: Merchant King and American Patriot. The bulk of biographical material on Dorothy Hancock comes from a fairly glorified “saintly” narrative style of late 19th and early 20th century biographers. 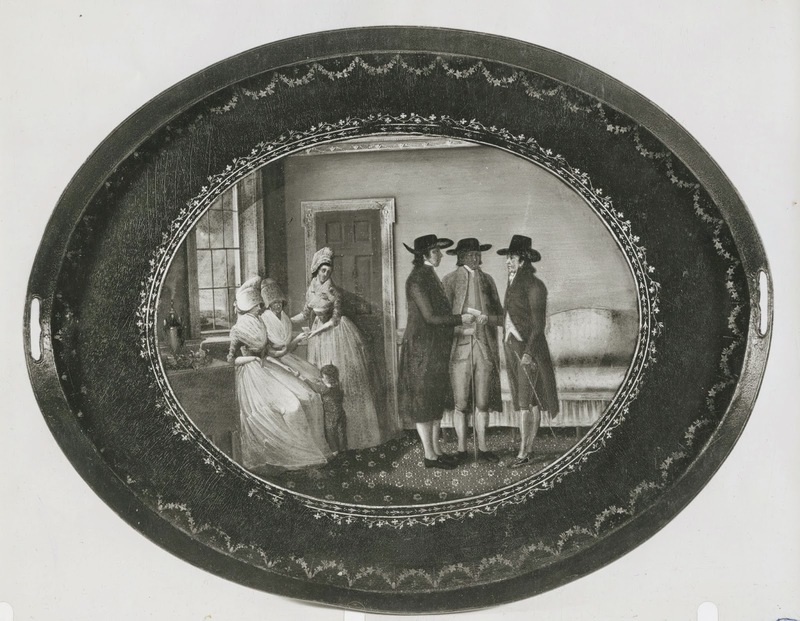 Conducting research at several Boston-based collections has prompted me to integrate into the family narrative several surviving objects related to the Hancock’s children and to flesh out the very real experience --one many of us can relate to -- of family grief and loss. Lydia Henchman Hancock (1776- 1777) was named in honor of John’s beloved aunt, Lydia Henchman Hancock (1714-1776) who essentially acted as a surrogate mother for both John and Dorothy. Baby Lydia died before she reached her first birthday. She was born in Philadelphia and died in Boston. In one letter, John notes that he is anxious to have the child inoculated once the baby and Dorothy arrived in Philadelphia. 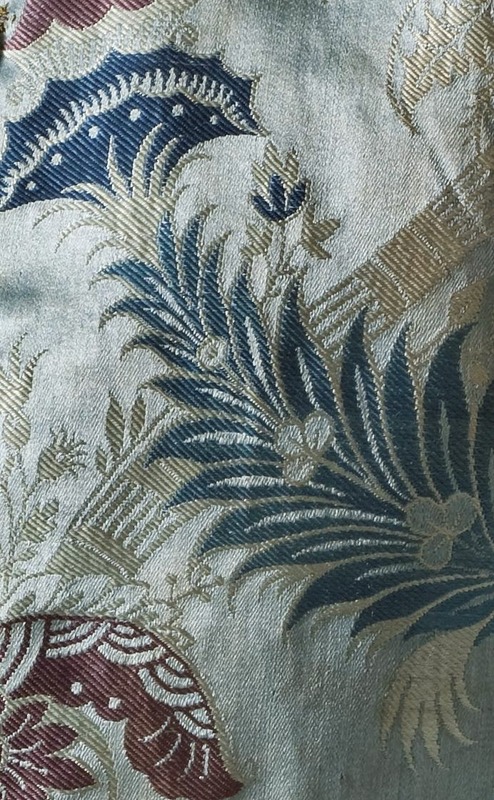 In a letter dated 10 March 1777, John writes to Dolly: “I have sent everywhere to get a gold or silver rattle for the child with a coral to send but cannot get one. I will have one if possible on yr. [your] coming.” 1 Unsuccessful, in his quest, he sends along “a sash for her”. John Hancock was busy attending to political matters and so Dorothy was on her own when the child died. John learned of the loss via letter. One can only imagine the sad aspect Boston must have held for her in that late summer of 1777: Aunt Lydia had died in 1776, Boston was deserted and John was away. Coming from such a large family, one suspects she had brothers and sisters to provide comfort, as well as members of the household staff, such as the stalwart and dedicated Mrs. Brackett. 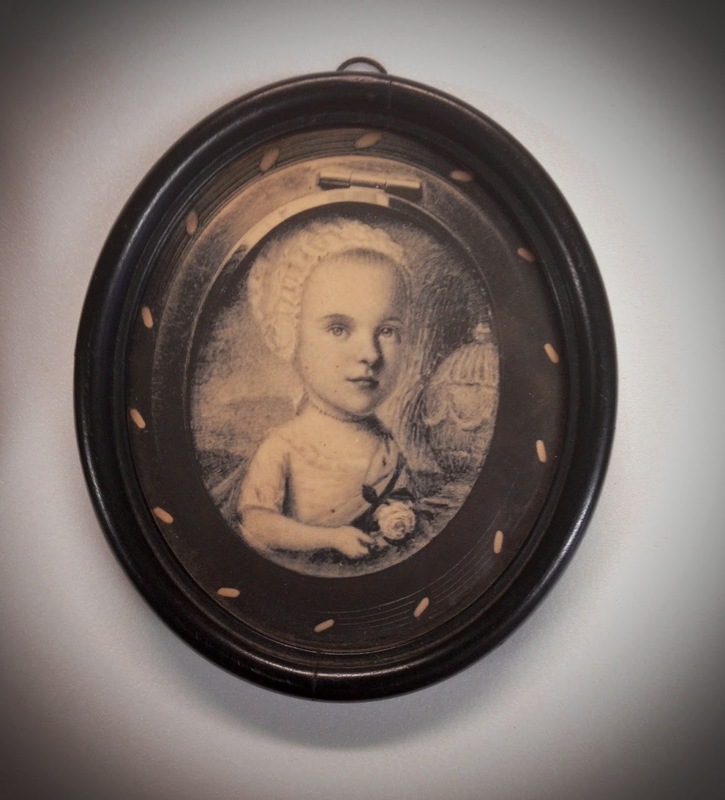 This surviving photographic copy of Lydia dates from the 1940s and was part of a locket (sold; whereabouts unknown; collection of http://www.masshist.org). A posthumous rendering by a currently unknown artist, it is charming despite its melancholy subject. The child has an infant’s over scaled head, fused atop a diminutive form, holding a single rose. She is clad in a baby cap, common to the time. Behind her, the oft used symbols of death and mourning, an urn and willow. Her face is lovely and sweet and highly delineated for a child of under a year. One can image the care with which her mother donned the locket holding the image. "This amiable child gave every indication of future eminence; and while his sweetness of temper, his strength of memory, and brilliancy of genius, led his parents to hope, that he would be not only the staff of their age, but eminently useful in the world!—Their hopes are suddenly blasted, and they feel the deepest affliction: Why falls the budding flower? Why dies the youth? Presumptuous reason crys. 'Tis not for us To search the ends of fate nor fault its means; Religion answers and our breasts are calmed." - Published in the American Herald, January, 1787. The miniature of Johnny is simple yet compelling. He is appropriately attired in the clothing of a youth of the day and his hair, unfettered. I was fortunate to view these fragile and delicate jewelry items at the MHS. It was an incredibly moving experience to gaze upon the bracelets and ponder what they meant in the lives of the parents who outlived their children. Clearly they were treasured. Suddenly it strikes you – you are looking at actual strands of John Hancock’s hair (over 220 years old), in combination with the hair of his children (blonde for Lydia and light brown for Johnny) crafted into a momento mori. In a CSI world of DNA anyalsis and so on, this form of mourning is an exceedlingly powerful talisman. Below find the catalog descriptions of the pieces from the MHS collections. Bracelet made of 2 strands of braided dark hair [of John Hancock?, d. 1793] looped together by a series of hollow gold beads. 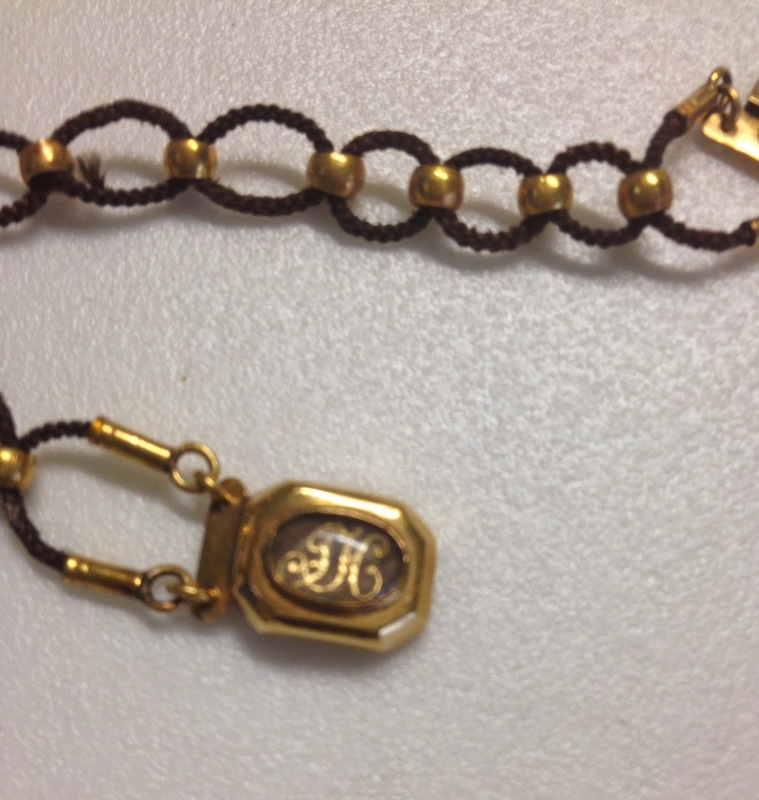 Elongated octagonal gold clasp has oval crystal front, under which are some strands of blond baby hair and gold cipher initials "LH". Engraved in script on back of clasp: "L Hancock/ Obt Augt 1 1771/ aet. 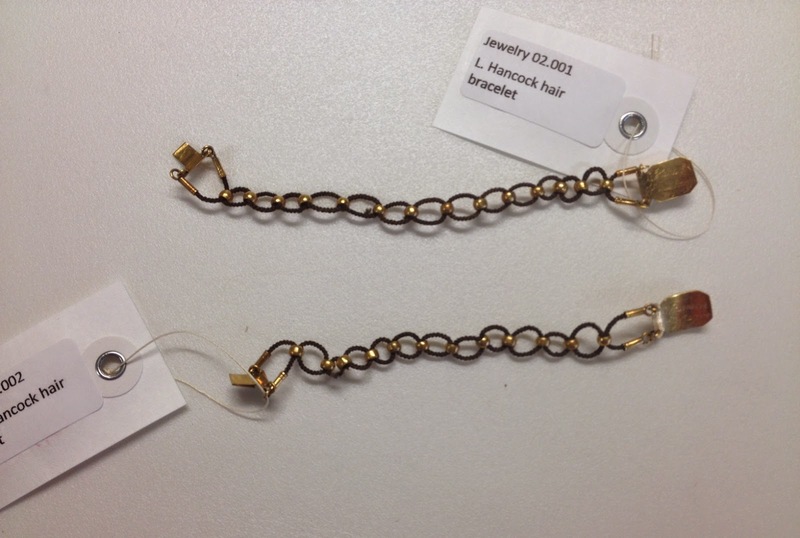 9. mo"
Bracelet made of 2 strands of braided dark hair [of John Hancock?, d. 1793] looped together by a series of hollow gold beads. Elongated octagonal gold clasp has oval crystal front, under which are strands of lighter brown hair [J.G.W. Hancock's], and gold cipher initials "JH". Engraved on back of clasp: " JGW Hancock/ Obt Jany 27, 1781/ aet 9. years"
2. For additional information on the mourning jewelry, see the excellent book “In Death Lamented: The Tradition of Anglo-American Mourning Jewelry” by Sarah Nehama, 2012. My thanks and appreciation to Anne Bentley, Curator of Art, Massachusetts Historical Society. 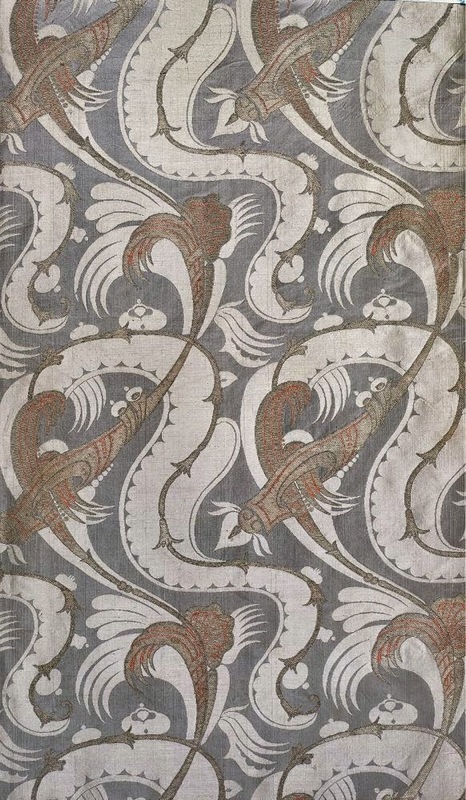 All illustrations are courtesy of the Massachusetts Historical Society.